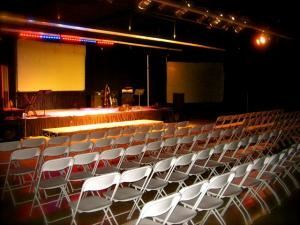 C3 Performing Arts Center is a multi-faceted facility and in the ideal location for your next event. Planning an awards banquet, talent show, conference, seminar or fundraiser we are the perfect venue! The 7000 sq ft Theatre has seating for up to 350 movable chairs, audio/visual state of the art equipment and 3 Large Screens. We also have breakout rooms available as well as a 3000 sq ft game room full equipped with a pool table, ping pong table, fuzzball, life size chess set and more. The building has wifi and a coffee shop in the foyer open for events. We offer a Free School of Music program to the community and as a newly opened Performing Arts Center our prices are very competitive for rentals. Please visit our website for more info.